Office 2013 adds too many steps to open files. You can cut one step when you open a file, or open the Open Explorer directly using a macro. How to create Places Bar shortcuts in the File Open dialogs in the Office 2013 applications. 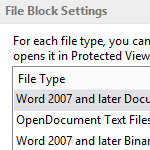 Check the File Block settings when you can't open an older file format in Office 2010 or Office 2013 applications. Type 1 fonts (and older fonts) aren't supported in Office 2013. A new feature of the Office 2013 applications is online templates. The Start screen window comes up when you double click on Word, Excel, and the other Office applications that make heavy use of templates. A list of the fonts installed by Office 95, Office 97, and Office 2000.